I’m going to try to write up what I saw, heard, and experienced at the anti-war demonstration in the Carmel Center, Haifa on Saturday, July 19th2014. This was a difficult and traumatizing experience, one of the worst I have faced in over a decade of activism. Please forgive rough writing. This is my point of view, and as such, is clouded. I can only write what I saw and experienced. All times are approximate. 9pm, opposite Ha’Agala Burekas restaurant, Moria Ave, Haifa: my partner and I are in my parents’ car, heading to the demonstration that is supposed to start at this location at 9:30. As we drive up, we see a huge police presence, including armored horses, a water cannon and hundreds of police. Getting closer, we see what they’re there for: over a thousand right wing counter-protestors have showed up, chanting, waving Israeli and army flags, calling the left ‘traitors’. 9:05pm: We call the organizers, in a half-panic. We’re told that the demo has been moved a few hundred yards down the street, nearer the Carmel Center. As we’re walking, I see a policeman shoving a man with a sign supporting the left. He’s bleeding. We later find out he was punched in the face by one of the right wingers. 9:10pm, at the entrance to the Kababir neighborhood, Moria Ave: we arrive at the new site for the demonstration. We’re practically alone with a ton of heavily armored police. At this stage, it seems utterly irresponsible to encourage people to march. Being outnumbered doesn’t begin to describe the situation we were in. We head off to a nearby restaurant for a few minutes. 9:20pm: People are trickling in. I walk around, trying to explain to folks there what I saw down the street (most people came from a different direction). I’ve been an activist for many years, and have attended hundreds of demonstrations. From experience, we can deal with the police, almost no matter what they do. We can’t deal with huge numbers violent counter-demonstrators out to kill us. A sense of bewilderment seems to be the dominant theme. 9:25pm: The main organizers ask us to move people into the adjacent park. I ask people to do so, and for the most part, they do. At this point, many counter-demonstrators have moved to stand opposite us, and are being held back by the police. Chants of “Death to Arabs”, “Death to traitors” and “Death to leftists” come from the other side of the street. Their numbers are swelling, fast. 9:30pm: We’re asked to move back onto the sidewalk from the park, as the police say they cannot protect us in the park. With all that’s going on, much of this gets lost. 9:45pm: Our side is swelling, but the other side is swelling faster. There are supposed to be buses arriving from other parts of the country. We chant slogans for unity: “Jews and Arabs refuse to be enemies”; “Both in Gaza and in Sderot, children want to live”; “Peace isn’t built on children’s bodies”; “Gaza, stand strong, we’ll end the Occupation yet”; and many more. Banners are raised. Red flags and Palestinians flags are waving. The other side is jumping up and down, singing nationalist songs, waving Israeli and army brigade flags, all the time pushing against the police line. Our side does not at all push against the police. There’s no point: if the line were to be broken, we’d be facing a raving mob head on. 10pm: Buses should be arriving from other parts of the country. They do not. We get word that the police has blocked buses of our supporters from coming. 10:05pm: One bus arrives, barely. It takes a long few minutes for the police to get the bus through the right wing folks. When they pull up, I go over to greet them. Turns out it was a bus from Nazareth. Our ranks are swelled a bit more. Still, we’re outnumbered, by a long shot. Over the next thirty minutes or so, one more bus arrives. We found out much later that four buses were blocked completely by the police. 10:45pm: By now, a few small scuffles have broken out between police and the counter-demonstrators. A couple of them are arrested. Chanting keeps up on both sides. We shout for life, they shout for death. I stay as close to the front as I can, right up to the police line. Tempers flare here and there. As a Jewish Israeli, it’s very very difficult for me to even consider trying to hold back Arab protesters. It isn’t my place. They have so much more to be angry about than I do. Our privilege, being identified by the state as being Jewish, is huge. Yet I seem to have taken on a role of responsibility, together with my Arab friends. This is a tough paragraph to write. I don’t want to appear arrogant. Yet it seemed at the time that all our efforts were appreciated by those trying to keep others from getting badly hurt. 10:50pm: A couple of demonstrators from our side get snatched by police and arrested, violently. Looking across the street, I see murder gleaming in the eyes of the fascists. I don’t use that word lightly, but when a huge gang is quite literally calling for us to be killed, it’s appropriate, I think. Much later, we find out that a few of our folks found themselves attacked by the right. One broken nose, one broken shoulder. Maybe more. A few bottles are thrown on us. Nothing much, at least not compared to what was to come later. 11pm: Someone decides to move into the neighborhood, away from the main street. People are terrified, as the counter-demonstrators are still swelling and getting closer. In principle, this should be the end of the demonstration. The police allow some of the counter-demonstrators across the street, near the bus. Other police try to herd some of our side onto the bus. The bus is headed back to another town. Police barely manage to get it out. 11:20pm: We’re trying to disperse. Outside of the West Bank, where protests are suppressed with heavy crowd-control measures, I’ve never been to a demonstration where the hardest part is leaving. A group of folks from Tel Aviv ask us to help them, to take them through the backstreets to where their bus is. They can’t find all their people. We stand with them in a courtyard, with people trying to get through the back the building. Suddenly, they come running back, shouting that the rightists are coming from behind. Across the narrow side street, many of them have moved opposite us, shouting and gesturing. Police are barely to be seen. 11:30pm: We move to the corner of the next street. There are around 100 of us left at this point, as many somehow managed to escape, perhaps on a bus, perhaps in small groups on foot. We can’t tell. My partner and I agree that we’re not leaving until everyone is safe. All three opposite corners, and quite a way down the streets, are covered with our opposition. It’s a terrifying scene. We’re surrounded. Police are hanging out in the middle, looking utterly clueless. Their horses and heavy machinery are nowhere to be seen. For only the second time in my life, I’m wishing for police protection. 11:40pm: Stones start flying toward us. Not many, but large. We have older folks with us, some over 70. We use the sticks holding our flags to try to deflect the stones like baseballs. A few hit people. People are bleeding. Police look almost as scared as we are, and still, they do almost nothing to help us get the hell out. They have helmets. Needless to say, we do not. This doesn’t stop. We chant those same slogans for unity: “Jews and Arabs refuse to be enemies”. It seems so damn empty at this point, facing hundreds of Zionist Jews who want to see us dead. Not in jail. Dead. I talk to a few people. The word ‘pogrom’ starts being whispered. These are highly experienced folks, for the most part,who do not use such words lightly. More stones. More chants for murder. We’re still trapped. A few people try to push out to escape the hell we’re in. They are pushed back by police and counter-demonstrators. 12:15am, July20th: The police try to get us out. People are throwing stones at us. Again, not many, but they’re coming from all sides, including the buildings we’re passing by. Police run into building entrances, pushing back those trying to attack us. They’re barely successful. I hear shouts and run toward them. I see one of our people on the ground, bleeding from his head. Police try to push us forward. A couple of us tell them, trying to be calm, that we have someone injured. A policeman says “fine, leave him there”. We do nothing of the sort. We pick him up. He’s ok, somehow. Adrenaline, I suppose. 12:30am: We’re still half walking half running down the street, surrounded by police. It’s a bit calmer, but the counter-demonstrators (perhaps, by now, rioters) are still not far behind us. We find ourselves at a traffic circle. Two police commanders are arguing about what to do. All we want is to get a bus. They keep changing up where they want the bus to be. I overhear one commander telling the other that there are another hundred rightists coming down the street. They do not know what to do. They order us further down the hill. 12:35am: The sidewalk ends on our side. Police tell us to get into the shadows. I hear one of them ordering a bus sent to us, empty, as fast as possible. Nothing happens, everyone is exhausted. They seem to holding back the counter-demonstrators up the street. 12:45am:A public bus is passing by with around six people aboard. Police stop the bus, tell everyone on it to leave, and shout at us to get on. We can’t believe this: the police have literally commandeered a bus. It takes a while, but we all get on. Eighty people packed like sardines onto a bus that holds fifty. The bus moves up the hill to turn around. As it does, it’s hit with a rock thrown at it. 12:50am: We start singing. People sing and laugh as the adrenaline starts to decline. We feel safe, for the first time in hours. 1am: As we head toward the shore, where another bus is waiting for us, a car covered with an Israeli flag pulls up. The driver shouts and gestures at us. This is our first hint that it’s not over yet. Some still feel safe enough to flash V for victory signs at him. 1:05am: We pull into the parking lot behind the beach restaurant, Maxim. We get off the bus. We wonder where the next bus will take us. One of the organizers tells us to get on, and we’ll sort that out later. The water cannon truck pulls in behind us, with a number of police vans. 1:15am: We’re on the bus, and we’re moving out of the parking lot. The police accompaniment leaves. We’re alone. Suddenly, we hear two or three rocks hitting the bus. Two windows are shattered. We push the broken glass out onto the street to avoid the pieces flying in due to wind and hitting passengers. The broken windows make the bus windy, full of fresh air. We’re tense, but we’re safe. 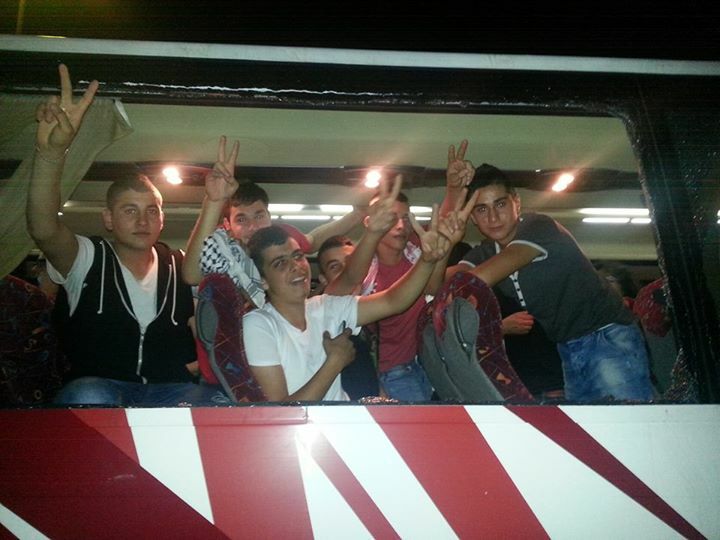 1:20am: The bus pulls up near the Haifa headquarters of the Hadash party, one of the main organizers. As we disembark, we take photos of the youth making victory signs out the broken windows. We’re safe. 1:30am: We go to headquarters to debrief, post reports, and decide on next steps. At some point later, my partner and I go get some food and drinks for ourselves and our friends. 2:30am: We head to the police station to wait for the eight arrested to be released. A somewhat surreal scene occurs when we encounter a demonstrator from the other side, doing the same. No tempers flare. 4:30am: After two hours of waiting, talking, trying to understand what happened and why, our prisoners are released unconditionally. We applaud. We go home. We sleep. We were lucky: one stone an inch to one side or another, and someone would have died. Quite a few people were injured. One broken nose; one shattered shoulder. One demonstrator hit in the head by police. Who knows what else?